Today we welcome Canadian author Dyane Forde to the blog, for an interview and to hear about her books. Dyane Forde’s love of writing began with an early interest in reading and of words in general. She was always amazed at how linking words together in different ways had unexpected and pleasing results. People enjoyed what she created! This sparked a life-long desire to write all types of things, from short stories, novels, flash fiction, poetry…she enjoys trying genres and forms of writing which are different from what she’s used to; every story or book represents new joys and challenges. Dyane views writing as an amazing and intimate communication tool, meaning that it becomes a means through which she seeks to connect with others on a level deeper than intellect. Dyane is a social worker by profession. Learning to see the world through other people’s eyes as well as sharing in their pain has influenced and enriched her as a person, as well as her writing. She is also a wife, and mother to two children, a cat named JackJack and a dog named Sparky. She can be reached at her writing blog at www.droppedpebbles.wordpress.com, where her other writing projects, and information and samples of her upcoming books can be found. Please write! Dyane loves to hear from her readers. 1) What is something people would be surprised to know about you? I love anime and Asian movies. I enjoy their unique method of telling stories through solid (and often complex) character arcs and stupendous imagery; they take risks which mean you either get on board for the ride or miss out. I think I connect with anime in particular because I feel that they show stories the way I see them in my head, something I’ve never really seen anywhere else. So, I’m hooked. 2) How do you react to a bad review? 3) Which authors have influenced you most, and how? I read Lord of the Rings when I was 12 and that book blew my mind. However, The Silmarillion is my all-time favorite. Though I don’t write that kind of fantasy, the sense of wonder, magic, and drama are elements I hope to capture in my stories, whether in fantasy or some other genre. Hemingway was another writer I loved for his minimalistic style. I emulated it for years, and though my style has changed over time, I still work hard to keep my work uncluttered and focused. The Knife of Never Letting Go, by Patrick Ness, told in first-person point of view in present tense, also had a big impact on me. The sense of immediacy and intimacy created by the combination of the POV and the tense helped me figure out how to add a layer of depth and feeling to my own writing so that my characters ‘feel’ like real people. Lastly, Margaret Atwood, my fellow Canadian, is my role model. She’s a fantastic writer and she can and does write anything. She’s gripping, funny, sarcastic and witty and she has a writing legacy that spans generations and countries. Her book Surfacing just gutted me, and The Edible Woman was a wonderful and humorous commentary on society and gender roles. 4) How did you celebrate the sale of your first book? lol Well, my parents bought the first books, but they were so proud and happy that, of course, I felt great. Any sale after that was just a blessing. 5) Night owl or early bird? I love to sleep in, but not for long or too much of the day is gone. When you’re a mom and working and writing, you need to grasp at every second of the day you can. 6) One food you would never eat? 7) Your most unusual or random habit? I like to twist my hair. It’s a habit I gave to Nyssa, the female protagonist in The Purple Morrow. 8) What are you working on at the moment – do you have any other books in the works? I’m currently revising Wolf’s Bane, book two of the Rise of the Papilion series, and book 3, Berserker, is in mid-production. I have a slew of short stories and flash fiction on my blog portfolio and a few novels-in-progress on the back burner. Most of my books are in the fantasy genre but my short stories are a mix of various genres and styles. 9) What inspired you to want to become a writer? I love crafting stories, and using words to create something memorable and unique while giving readers an unforgettable experience. It’s great to know that there are people out there looking forward to my next story or book excerpt. 10) What has been your most rewarding experience since being published? The feedback. It’s always amazing to hear that people who don’t usually read fantasy really enjoyed The Purple Morrow because the world-building and the characters engrossed them to the point they forgot about the genre and allowed themselves to experience the story as it unfolded. 11) If you could jump in to a book, and live in that world, which would it be? The world of Middle Earth in the Silmarillion era–but only as an observer since everyone who lived in those stories was miserable or endured some pretty crummy circumstances! 12) Is there a song you could list as the theme song for your book? There’s this song by Deadly Avenger called Outro, and every time I hear it I can envision the book (movie) trailer for Morrow in my head. It’s a fantastic song. 13) What’s one piece of advice you would give aspiring authors? Two things, actually: 1) Don’t expect writing quality pieces to come easily– perseverance is the key. Achieving powerful writing takes time and lots of practice, so expect to rewrite over and over again. And again. 2) Learn to love to edit. Learning to find and correct your own mistakes only makes you a better writer, and a good edit is essential to making your final vision a success. The Rovers were sent to decimate the Southernlands. Instead, they awoke its savior. Ten years have passed since the Rover army tore through the Southernlands, leaving behind a trail of devastation and death. Most believed the attacks were random acts of brutality. The wise, however, knew the truth: the Rovers sought to destroy the one thing powerful enough to thwart their conquest. They were searching for the Papilion. A new commander, bent on completing the mission left unfinished by his predecessors, leads the Rovers back into the Southernlands. Fierce and determined, he comes armed with a precious artifact and a secret purpose. While the Southernlands reel under the new terror, the Purple Morrow, a harbinger of hope, appears to Jeru, an unsuspecting and solitary clan hunter. Finding himself enmeshed in a series of incredible events beyond his control, Jeru is compelled to take the first steps towards discovering his ultimate destiny. 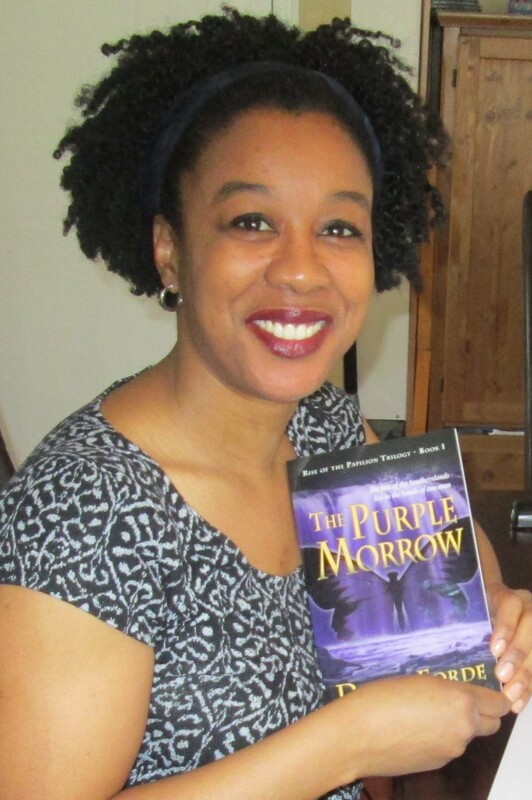 This entry was posted in Author Interviews, Interviews, May 2014 - Indie Author Month and tagged Canadian author, Dyane Forde, IAM, IAM2014, indie author month, interview, The Purple Morrow. Bookmark the permalink. My newest author interview, hosted by IAM Interview. Check it out! An awesome interview as always, Dyane. I love learning more about your process almost as much as I loved the Purple Morrow. Can’t wait for the next one to come out!